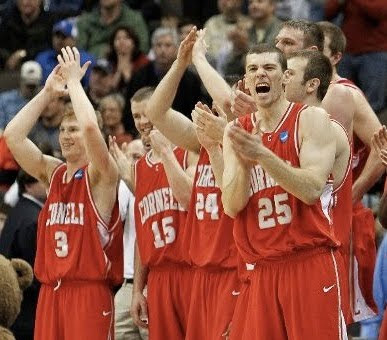 Cornell University's men's basketball team became the first Ivy League school to make it to the NCAA Sweet Sixteen since 1979 by beating the University of Wisconsin 87-69 on Sunday. Not to say that there weren't some - including ESPN's Andy Katz and Jay Bilas - who could see this thing coming, and how. Chris Wroblewski, #3, is majoring in above-the-head hand-clapping. In 1979, the same year that Larry Bird's Indiana State and Magic Johnson's Michigan State University would eventually play for the title, the University of Pennsylvania reached the Final Four by beating - among others - North Carolina and Syracuse on their Cinderella journey. Cornell faces an equally difficult task this Thursday, when the Big Red will take on the heavily-favored University of Kentucky Wildcats. But there are plenty out there who believe the Big Red can keep on screening and stroking. 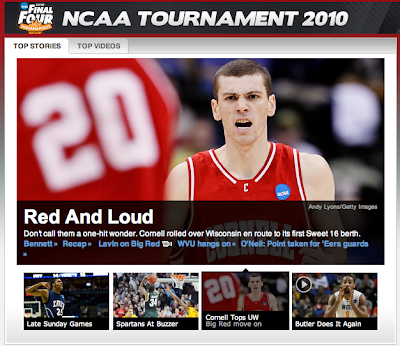 Oh, and one more thing: that the game will be staged in Syracuse, NY, just 57 miles from Cornell's Ithaca, NY campus. ESPN loves an underdog. To be fair, they love Duke, too. Other fresh faces in the Sweet Sixteen this year include Northern Iowa, Butler, St. Mary's, and Xavier. 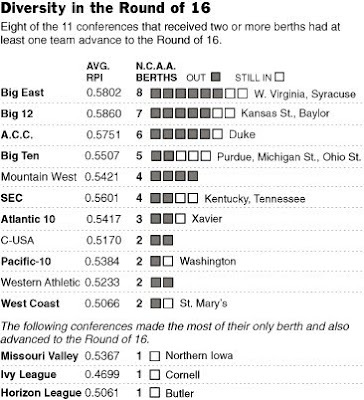 The precipitous rise of these mid-major schools have led the New York Times to wonder whether the NCAA selection committee is doing a disservice to the tournament by favoring the power conferences (Big East, Big 12, Big Ten, ACC, Pac-10, SEC). Is the Big Ten winning? If there's any way to slice it, clearly, the Big East was the biggest loser through the first weekend of the tournament, in more ways than one. Just two of their eight teams survived the opening two rounds but, to add insult to injury, Darren Rovell claims that the first-round losses of Georgetown, Marquette, and Notre Dame last Thursday cost the Big East almost $4 million in revenue (earned from playing in future games) on that day alone. Rovell's estimates do not include the three other Big East casualties from the weekend: Louisville's loss on Friday, Villanova's loss on Saturday, or Pittsburgh's loss on Sunday. The other thing that we now know, for sure, is that Big East is not the country's best (although it is the biggest) and all the talk about the depth of the Big East can stop. Like when Big East commissioner John Marinatto said, after the NCAA tournament field was announced, "Receiving eight NCAA bids is a testament to the depth of our conference this season. Since the Big East expanded to 16 institutions five years ago, we believe the overall level of play...has been consistently outstanding." Or when Georgetown coach John Thompson III insinuated the conference's tremendous depth last month, "Across our league, the differences between the top teams and the guys who are down at the bottom is a magnification of small differences." Right. If only Marinatto or Thompson were talking about the entire NCAA tournament field would they be correct. Because if there is anything that the past weekend has taught us, it's that NCAA basketball this season is in a state of ultimate parity and that there are good - and maybe even great teams - scattered throughout every conference in the country.